If you encounter difficulty reserving rooms at the show rate, please go ahead and make the reservation at the lowest quoted rate and then contact us using the web form. Be sure to include your reservation number. 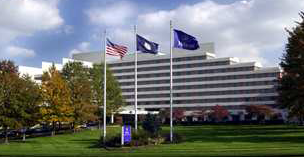 The Hilton McLean Tysons Corner is just outside the Capital Beltway (I-495), 4 miles south of the Maryland border and 10 miles north of the junction of I-95 and I-495. Directions from the Beltway: Take Exit 46A (State Route 123 South/Chain Bridge Road). Turn right at the first traffic light (Tysons Blvd). Take the next right at the top of the hill onto Galleria Drive. Stay in center lane and follow signs to Westpark Drive and Jones Branch Road. Turn right on Jones Branch Road (turn right). The Hilton is down the hill on your right. Enter the driveway just before hotel and proceed to the free, 1000 space parking lot at the rear of the hotel. Metro Silver Line to McLean Station. The Hilton van will run hourly during show hours. Exit the station to Route 123 (Chain Bridge Road), cross pedestrian bridge, and end up at the “Kiss ‘n Ride” area for a pick up. Alternatively, take Metro Orange Line to Dunn Loring-Merrifield, then the 2T Metrobus to the hotel (the stop is at 7915 Jones Branch Dr., approximately 210 feet from the hotel). The bus ride is about half an hour.